For more than 20 years, Vista Technology has been providing recruitment and placement excellence by connecting the right employees with the right companies. When you work with Vista Technology to find a new opportunity you can expect that we will do everything we can to make your experience a positive one. From this page you can access a variety of resources from advice in interviewing to resigning your position to relocating to a new community. If you have any suggestions for additional resources please let us know. 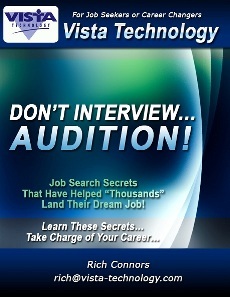 Vista Technology would like to acknowledge Bill Radin of Innovative Consulting, Inc.. Bill has written extensively on the subject of candidate search. It is his model by which the reports you read, form the foundation of our Candidate Resource Center.